Connect your incoming water into your water filter system by means of a saddle valve is the easiest option and avoids the need for any plumbing. They are simply attached by means of a fixing bracket and the screw tap pierces the pipe, creating an instant connection. 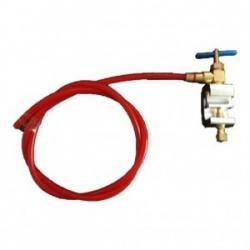 If you do not want to use a saddle valve, you can use a standard 15mm connection to 3/8 Inch tubing. All options are below. Spectrum Mains Water Clamp Self-Piercing Saddle Valve for Water Filter System with 1/4" (6mm) Tu..